Sometimes, perhaps often, it's better to be lucky than good. And maybe the Craft Brew Alliance was lucky when it bought Kona Brewing in 2010. Or maybe that purchase was part of a well-informed, ingenious plan that has worked out especially well for them. Because it turns out that Kona has stepped to the forefront of the CBA's brand portfolio. After accounting for just 20 percent of CBA sales early on, Kona now accounts for 45 percent of the mix, up 17 percent in volume over the last year. It is the dominant CBA brand. Recall that, prior to being purchased by the CBA, Kona was contract brewed by Widmer and Redhook for a number of years. Part of this was a tax dodge, a way around Hawaii's draconian tax on empty bottles shipped to the islands. It was also a way to more easily market Kona on the mainland. With the coming of CBA ownership, Kona gained full access to the Anheuser-Busch distribution network. As you likely know, AB owns roughly a third of the CBA and has worked diligently to market its brands domestically and internationally. For Kona, the arrangement changed everything. 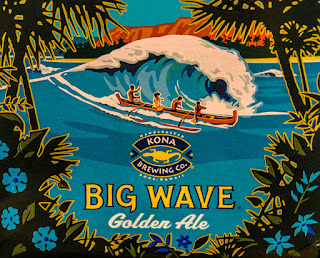 Access to the AB network essentially drove Kona into hyper growth, despite the beers being arguably the softest and least distinctive in the CBA portfolio. The year-round beers include Longboard Island Lager, Big Wave Golden Ale, Fire Rock Pale Ale and Castaway IPA. Nothing too exciting. One may rightfully wonder how Kona could rise to the top of the CBA heap, which includes some vaguely distinctive Widmer beers, alongside a covey of less than stellar Redhook stuff. The answer, in my mind, is image. Kona is connected to place in much the same way Corona is. Kona is much better beer than Corona, but they both lean heavily on connection to place in their marketing. Constellation will do something similar with Ballast Point. There's more, of course. These Kona beers, particularly top-selling Longboard and Big Wave, have caught on in a lot of places precisely because they aren't all that distinctive or aggressive. Kona is proof that, when you want to appeal to a broad consumer audience, mundane isn't such a bad thing. And maybe Kona's connection to place works well with drab. An interesting twist involves where Kona is brewed. Most consumers assume they're drinking a Hawaiian product. That's far less the case than many realize. The bottle tax means bottled Kona is produced on the mainland, even for the Hawaiian market. That's less true with draft beer, at least some of which is produced in Hawaii for that market. The situation may be changing with the expansion of Kona's facility on the Big Island and other developments on the islands. Regardless, the CBA is hitching its wagon to Kona and counting on the brand to pull it into the future. You can't blame them. When you have a winner, whether you got it by luck or via a proactive plan, you might as well ride it for as long and as far as you can. Kona is the little engine that could...or can, if things work out for the CBA.